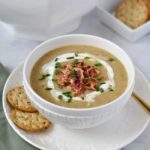 If there’s one soup you need to make this month, it’s this Instant Pot Potato Leek Soup with Bacon. 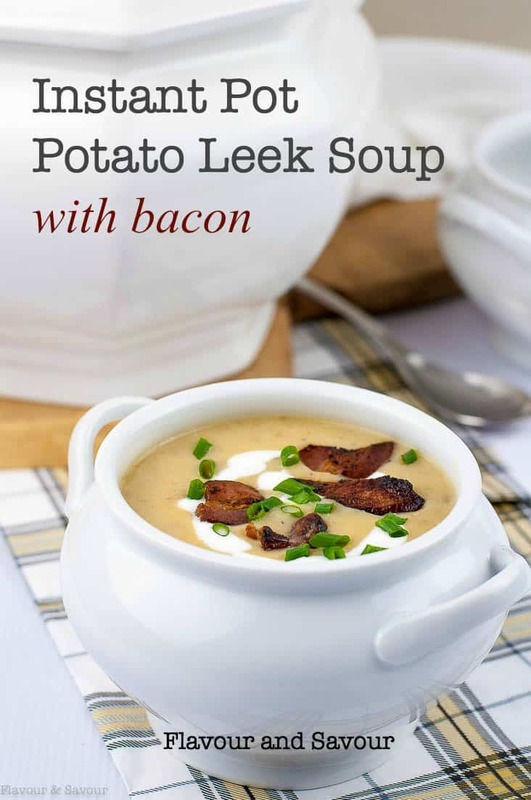 Smooth and creamy, this full-flavoured paleo Potato Leek Soup with Bacon is one of my new favourites. All made in one pot, it’s easy to prepare: minimal chopping, it’s quick to cook and there’s only one pot to clean. A win-win. It’s like a fully-loaded baked potato in a bowl of soup. I had to laugh while we had this for lunch recently. I suddenly realized that it was similar to a baked potato with “all the fixin’s.” If you’re anywhere near my age, you might remember how loaded baked potatoes were popular in restaurants. The server would come to your table with an assortment of toppings, usually sour cream, bacon bits, chives, and grated cheese for you to load up, or overload, your potato. That was on top of the melted butter that was already oozing its way into the oversized spud. While those baked potatoes are no longer trendy in restaurants, we still love those flavours. 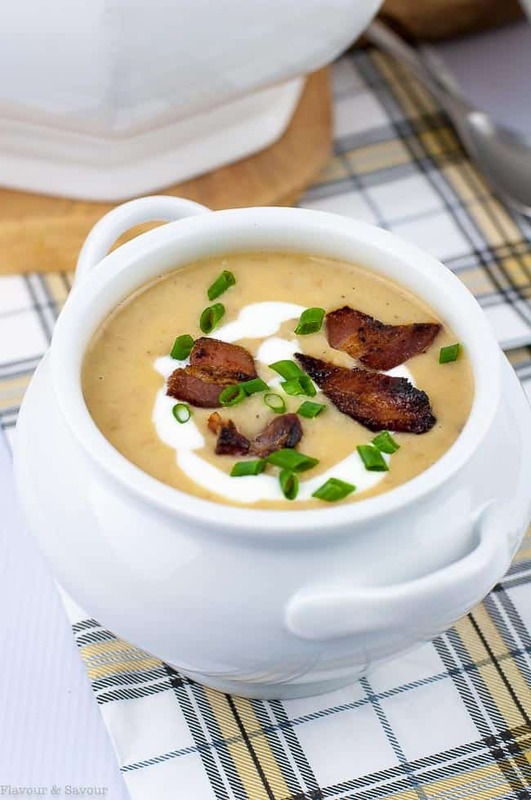 Besides the flavour, there’s a lot to love about this Potato Leek Soup! In particular, I love how easy it is to make! One pot, a quick sauté, then 22 minutes of cooking and steam release time while you make a salad and clean up the kitchen. Then all it needs is a quick whir in the blender before it’s ready to serve, piping hot. Pour leftover soup into freezer containers, label and freeze, and you’ll have lunch for another day. Gently reheat on the stove top or in a microwave. I served it with Super Seedy Snack Crackers. No Instant Pot? No worries. 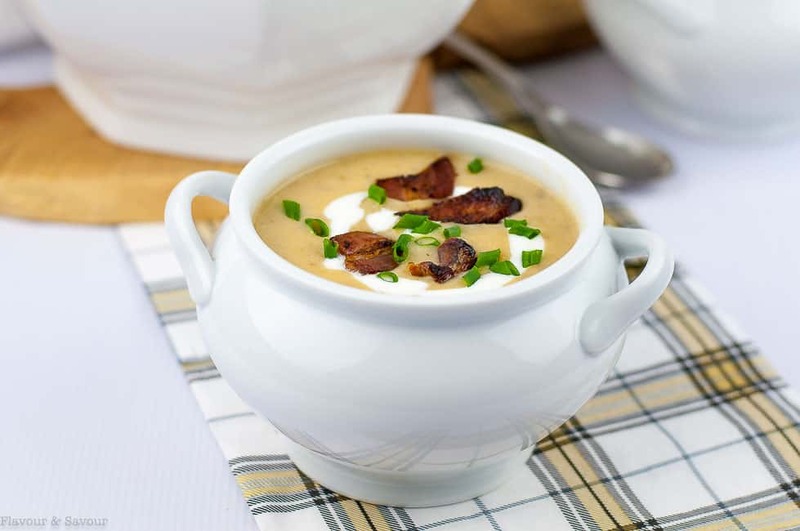 You can easily make this Potato Leek Soup on the stove top in a large, heavy-bottomed pot. Just follow the instructions below, but lengthen the cooking time, cooking until the potatoes are very tender before puréeing the soup. However you decide to cook it, this soup is bound to become a favourite in your home, too! Smooth and creamy, this full-flavoured Instant Pot Potato Leek Soup with Bacon is made with Yukon Gold potatoes, leeks and bacon. It cooks quickly in an Instant Pot. Press the Sauté button on the Instant Pot. When it is hot, add the bacon. Cook, stirring occasionally until crisp. Meanwhile, wash and slice the leeks into thin rounds. Add to the pot once the bacon is crisp. Cook until soft. Add the flour and stir until it is well mixed with the leeks and bacon. Stir in the chicken broth, salt, pepper and potatoes. Put the lid on. Set the steam release button to Seal. Press the Manual button and reduce (or increase) the time to 7 minutes by pressing the - or + key. Once the cooking cycle has finished, let the steam naturally release for 15 minutes. Manually release the remaining steam. Open the lid. Stir in the cream, milk or almond milk. Either use an immersion blender to blend the soup, or transfer it to a blender. I like it left with a few small chunks instead of completely puréeing it. Transfer to serving bowls and garnish with a drizzle of sour cream or yogurt, fresh chives or green onions, and bacon bits. Once the bacon is crispy, remove a few pieces, drain on paper towel, and set aside for a garnish. Nutrition facts were calculated using unsweetened almond milk. Love your Instant Pot? 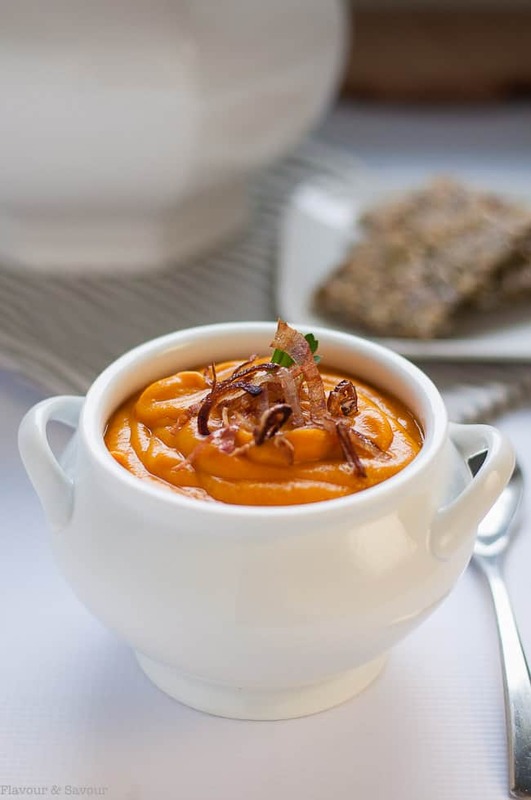 You might like this Sweet Potato Turmeric Soup. I adapted this recipe slightly from The Simple Happy Foodie. See her original recipe here. When do I add the 1/2 cup of milk/cream? Add it after cooking, just before you blend the soup. Thanks for pointing that out! I’ve corrected the recipe. Enjoy! Yes I added the milk before I blended it and it tasted great. Also added 1/4 tsp thyme and served the soup with sour cream and shredded cheddar cheese. That sounds so good! Thanks for sharing your ideas. Love the idea of cheddar on top! My family really liked this soup. I made it in my new Instant pot and it was super easy. I didn’t have any cream so I just used milk but it was still thick and creamy. The first thing I cooked in my brand new Instant Pot. It was awesome! Thanks for letting me know! Here’s to lots more successful meals with your Instant Pot! Made this tonight, it was amazing! This is amazing. I did leave out the cream (or alternative) entirely and did use my immersion blender leaving some chunks and it is terrific. Using the immersion blender did create the creaminess. We are dairy sensitive in our fam so this recipe is one that can leave it out and still be great. Super easy in my IP and I shared with my daughter so she can try it. This makes me so happy! Thanks for sharing your ideas with my other readers, too! So glad you liked this recipe. Delicious – thanks for sharing! You’re welcome! Happy that you liked it!